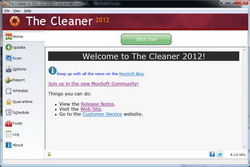 MooSofts' The Cleaner 2012 is a powerful anti-malware program. 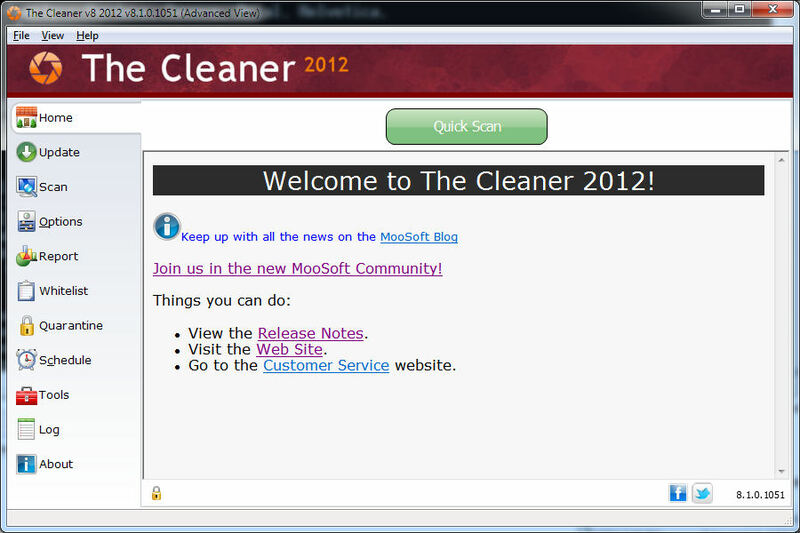 MooSoft's The Cleaner 2012 este un program redutabil anti-malware.Acest program detectează şi curaţă ameninţările malware care sunt omise de obicei de un program anti-virus. Acest program dispune de cea mai rapidă şi sigură metodă de scanare de pe piaţă. Dispune de scanare comandată individual pentru drivere, directoare sau fişiere, sau poate scana întreg computerul. The Cleaner a fost conceput şi dezvoltat în decursul a mai mult de treisprezece ani şi este utilizat în peste 140 de ţări. The registration site DON'T WORK first time when accessed and second time display a nice " You already have a code!" Hello guys! I have finally installed The Cleaner 2012 but when i access http://www.moosoft.com/gotd/ the page says "You already have a code"..What is this error because i didn't recieve any code...Thanks for helping me! www.moosoft.com/gotd = You allready have a code. Folositi orice alternativa gratuita. MalwareBites matura cu asta pe jos din toate punctele de vedere. Pe langa toate neajunsurile, The Cleaner are o viteza de scanare egala cu viteza melcului in treapta a 2-a, in localitate. Daca aveti de scanat cateva sute de GB va dura o vesnicie. NU VA RECOMAND ACEST PRODUS! www.moosoft.com = Fatal error: Out of memory (allocated 19398656) (tried to allocate 94 bytes) in /home/moosoft/public_html/libraries/joomla/language/language.php on line 353 www.moosoft.com/gotd = You allready have a code. Folositi orice alternativa gratuita. MalwareBites matura cu asta pe jos din toate punctele de vedere. Pe langa toate neajunsurile, The Cleaner are o viteza de scanare egala cu viteza melcului in treapta a 2-a, in localitate. Daca aveti de scanat cateva sute de GB va dura o vesnicie. NU VA RECOMAND ACEST PRODUS! I have just been made aware of an inaccuracy in the text file included with the installer. Where it says "1) No free technical support 2) No free upgrades to future versions"
This is incorrect, GOTD users will be treated just as any other customer and given technical support and free upgrades/updates while their subscription is active. I know a few people that were going to the site had problems with the server crashing. We made changes to the server and it is now handling the traffic without error. For those who were not able to load the page and are now told they already have a code please email support@moosoft.zendesk.com with your IP address and we will remove it from the list so you can get your code. Regarding the few comments I am seeing with (....) users complaining that they are only getting a FREE 12 month license - This is how most AntiVirus and AntiMalware type products are now licensed. 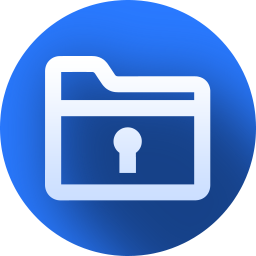 The Cleaner 2012 - is no exception - paying users also receive a 12 month subscription, and the offer from Moosoft is the equivalent in terms of license/subscription duration that any other paying user would be entitled to (12 months). Keith, The Cleaner will often detect non-default security settings in the initial scan. This is because malware tends to turn off things that should be on such as firewall and security center. The Cleaner is updated frequently as threats are always changing. We attempted to get the latest version to GOTD but were unable to contact them in time. You can go to the Report tab while it scanning to see what it found. Keith, The Cleaner will often detect non-default security settings in the initial scan. This is because malware tends to turn off things that should be on such as firewall and security center. 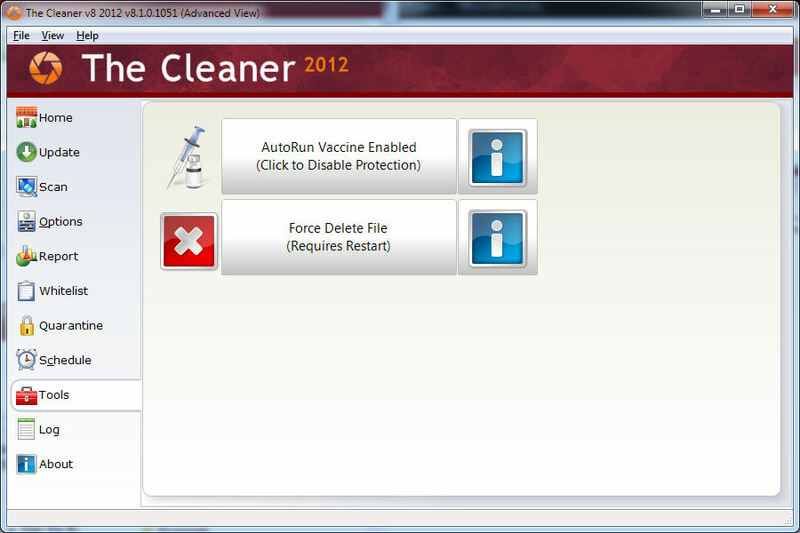 The Cleaner is updated frequently as threats are always changing. We attempted to get the latest version to GOTD but were unable to contact them in time. You can go to the Report tab while it scanning to see what it found.